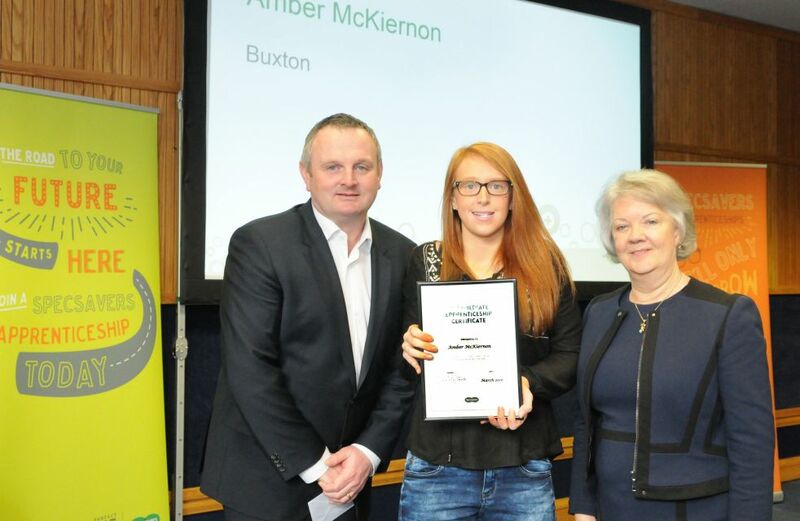 An apprentice at Specsavers in Buxton is embarking on a rewarding career in eyecare after completing the opticians’ Optical Apprenticeship programme. As the nation marks National Apprenticeship Week (Monday 14 until Sunday 20 March) 21-year-old Amy McKiernon is a graduate of the UK’s biggest government-accredited scheme which currently has more than 240 people currently enrolled. Amy says: ‘I don’t think there’s a more effective and interesting way of building your knowledge and experience than an apprenticeship and best of all, in my case, it has led to a full time position. ‘I’ve learned so much in store and that shows no sign of stopping. I’m a store merchandiser and I’m currently studying for my Specsavers Cert 3 accreditation, which I’m thoroughly enjoying. ‘Throughout my apprenticeship, not only did my colleagues in store do everything they could to help me balance my work with my studies, help and advice was always at hand whenever I needed it which was hugely reassuring. Specsavers’ one-year apprenticeship is open to anyone over the age of 16 and requires no previous optical experience. Those that complete it become qualified optical assistants with the chance of full time employment at Specsavers. The programme also opens up successful apprentices to further studying opportunities, with the potential to qualify as a dispensing optician within five years. Specavers Buxton store director Tom Rhodes says: ‘We believe that apprenticeships are a great way to unlock the potential of young people and provide a way for them to embark on successful and fulfilling careers. The programme includes the completion of the Level 2 Diploma in Optics, monthly assessor visits, observations, online learning and courses. Apprentices also learn on the job, working in-store alongside eyecare professionals. They become a key member of the store team, welcoming customers, giving them advice, booking in eye tests, carrying out pre-screening and helping the store to run as smoothly as possible. The apprenticeships scheme has been running for just over two years and 90% of the apprentices take on full-time positions within the company. At least 33% of those who take on a full-time position go on to further studies with Specsavers, with many training to become dispensing assistants through Specsavers’ externally-accredited Level 3 and Level 4 Certificates in Optical Dispensing. These is turn offer stepping-stones to further study to eventually qualify as a dispensing optician.